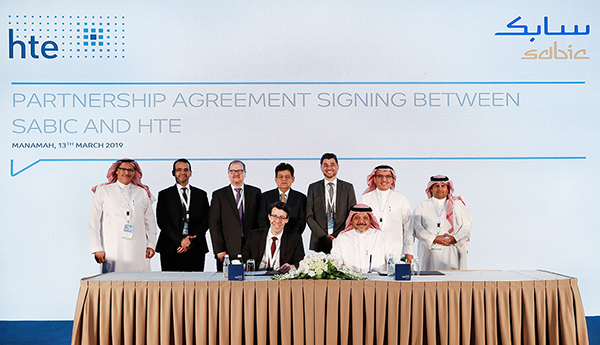 On March 13, 2019, SABIC and hte extended plans for collaboration for five more years to increase efficiency through digitalization and high throughput technologies in catalysis research and development (R&D) in petrochemicals. Dr. Fahad Al-Sherehy, Vice President, Technology & Innovation, SABIC and Dr. Wolfram Stichert, CEO at hte, celebrated the signing of the Umbrella Research Agreement at the 6th GPCA Research and Innovation Summit in Bahrain, held under the patronage of H.E. Shaikh Mohammed bin Khalifa bin Ahmed Al Khalifa, Minister of Oil, Bahrain, where SABIC participated as the platinum sponsor. The agreement stipulates that SABIC and hte will maintain the operation of SABIC’s satellite laboratory for high throughput experimentation in Heidelberg, Germany and will install and operate a new high throughput experimentation laboratory at SABIC’s Corporate R&D (CRD) site at King Abdullah University of Science and Technology (KAUST). With this partnership, hte will also support SABIC in digitalization in R&D. Building on the previous successful collaboration, SABIC and hte are extending their strategic partnership to include fast-track catalysis R&D. Under the agreement, SABIC will continue operation of the SABIC satellite High Throughput Experimentation Lab, established in 2015 at hte’s facilities in Heidelberg. In addition, SABIC will have the opportunity to transfer hte’s institutional knowledge to its own corporate R&D center at KAUST in Saudi Arabia. SABIC and hte will also set up a new high throughput experimentation laboratory based on the established satellite laboratory in Heidelberg. This center will provide access to the latest technology and expertise to accelerate innovation in petrochemicals. Its close proximity to commercial plants will enable SABIC to support and optimize plant operation and productivity more efficiently. The overall aim is to decrease time and costs for the development of new catalysts and petrochemical processes considerably, and ultimately, to reduce their time-to-market. SABIC considers research and innovation to be a key pillar in the achievement of sustainable growth and competitiveness while considering the highest standards of safety, health, and environment, which set the groundwork for enabling Saudi Vision 2030. Technology Solutions: integrated hardware and software solutions, enabling our customers to establish high throughput workflows in their own laboratories. Our customers benefit from a broad technical and scientific expertise, an exceptional customer orientation, complete end-to-end solutions, and an outstanding data quality. Our close ties with BASF guarantee long-term orientation and stability. SABIC is a global leader in diversified chemicals headquartered in Riyadh, Saudi Arabia. We manufacture on a global scale in the Americas, Europe, Middle East and Asia Pacific, making distinctly different kinds of products: chemicals, commodity and high performance plastics, agri-nutrients and metals. We support our customers by identifying and developing opportunities in key end markets such as construction, medical devices, packaging, agri-nutrients, electrical and electronics, transportation and clean energy. SABIC has more than 33,000 employees worldwide and operates in around 50 countries. Fostering innovation and a spirit of ingenuity, we have 11,738 global patent filings, and have significant research resources with innovation hubs in five key geographies – USA, Europe, Middle East, South Asia and North Asia. The Saudi Arabian government owns 70 percent of SABIC shares with the remaining 30 percent publicly traded on the Saudi stock exchange. hte is a leading provider of high throughput technology and services for a faster and cost-effective catalysis R&D. We enable cost-effective innovations and reduced time to market for new products, thereby allowing our customers to keep ahead of the competition. Sign in for our newsletter and stay informed about upcoming news and events.